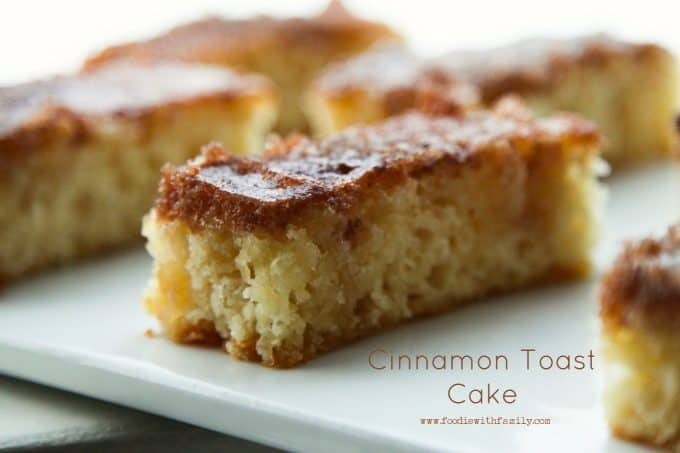 Cinnamon Toast Cake. It’s a thing, and it is glorious. 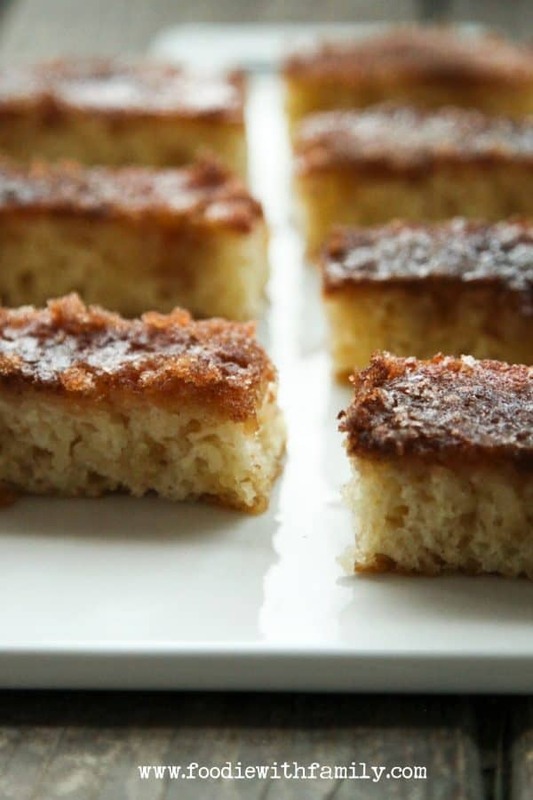 Introduced to me by my sweet friend Mary, these Cinnamon Toast Cake bars have become a staple in our snack food arsenal. And by staple, I mean I’ve made them 5 times in the past 3 weeks. Please don’t calculate how much butter that means we’ve eaten. In my defense, I HAD to make it 5 times, because every time I left the room for more than 5 minutes after cutting one of them up, I came back in to find the pan appeared to have been attacked by savages who had a major collective sweet tooth. Actually, that’s a pretty good description of my husband and kids when it comes to this Cinnamon Toast Cake. “Ambrosia!” That’s what my husband said when he had his first bite. Then he looked at it and said, “Oh my gosh. Is this soaked in butter and covered in cinnamon sugar?” When I responded that it was indeed, he make a little whimpering sound and finished the rest of the piece of cake off in one bite while reaching for another simultaneously. I can’t blame him. What he was eating was a moist vanilla butter cake that was baked, doused with melted butter and sprinkled more than liberally with cinnamon and sugar, then popped back in the oven until the cinnamon sugar layer had become bubbly and crusty. Good grief. I mean, really. Truth: It’s hard to go wrong when you combine as much butter, sugar, and cinnamon as appear here. Really it is… But if you avoid dairy for whatever reason, I’m here to tell you there is some good news. 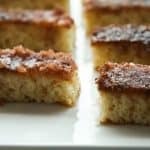 Cinnamon Toast Cake is also BEYOND delicious when made with coconut oil and cashew milk (or another nut milk.) I mean “eat a whole plate before you know what you’ve done” good, a fact to which my good friend Sarah will attest. Please don’t forget to butter your pan generously before you do anything else. Really get into the corners and seams of the pan. Those are the places the caramelized sugar likes to cling and stuck cake is sad cake. Speaking of pans, the size you want to use here is -in food service parlance- a half-sheet pan. The measurements of that pan are roughly 18-inches by 13-inches by 1-inch. If you don’t have one, I advise you snap one or two up. They’re DEAD handy in the kitchen and I even make whole meals on them at one time. You can grab them at restaurant supply stores or Amazon.com. Whisk together your dry ingredients (flour, sugar, baking powder, and salt) to get them evenly distributed amongst each other, then switch to a silicone spatula for the addition of the wet ingredients. This should prevent you from overmixing the cake batter making the finished Cinnamon Toast Cake more tender. The baking of Cinnamon Toast Cake goes in two stages. The first is 23 minutes of baking… just until it is set up and starting to pull away from the edges. You pull the pan from the oven, pour about 2/3 of your butter over the top, coat with the cinnamon sugar, and pour the remaining 1/3 of the butter over the top. Back into the oven it goes just until the cinnamon sugar layer is bubbly. This is what gives you the crusty cinnamon sugar top layer and seriously moist cake. Trust me. VEGANS: Cinnamon Toast Cake is amazing when you sub in equal parts extra virgin coconut oil and cashew or almond milk for the butter and dairy milk. Please give it a try. My vegan buddies went nuts (GET IT?) for it. This recipe produces moist vanilla butter cake that has been baked, doused with melted butter and sprinkled more than liberally with cinnamon and sugar, then popped back in the oven until the cinnamon sugar layer becomes bubbly and crusty. Adapted gently from and with MASSIVE cinnamon thanks to Barefeet in the Kitchen. Generously butter a half sheet pan, taking care to get the corners and seams very well greased. Set aside. In a large mixing bowl, use a whisk to combine the flour, sugar, baking powder, and salt. Switch to a silicone spatula, add the wet ingredients, and combine just until no more dry pockets remain and the mixture is even if not smooth. Scrape into the prepared pan and smooth to even it out. Bake for 23 minutes. While the cake is baking, whisk together the sugar and cinnamon for the topping. After the cake has baked 23 minutes, remove it from the oven, pour about 2/3 of the melted butter evenly over the top, sprinkle all of the cinnamon sugar evenly over the butter, then drizzle the remaining butter over that. Return the pan to the oven and bake an additional 8 minutes, or until the cinnamon sugar and butter layer is bubbly. Remove the pan from the oven and let cool on a heat proof surface for at least 30 minutes before slicing into long bars, about 3-inches by 1-inch. Store leftovers tightly wrapped at room temperature. In case you doubt my description of this cake as being utterly habit forming, check out the discussion about it on the King Arthur Flour Baking Circle Community. Cinnamon Toast Devils, eh? I wholly concur. I just made it! Its soon good. Perfect Friday afternoon treat for a house full of kids coming home from school. My oldest son said “wow this is like french toast!” Thank you, I really enjoy your blog. Well, all I know is that when I saw Mary’s recipe of it, I knew I had to make it. And then I made it 6 times in a couple of weeks. Bad me. BAD me. Naughty Mary! I’ve been told by the powers that be (21 yo) that I cannot make it until all the oatmeal chocolate chip cookies are gone. That will probably be Tuesday or Wednesday, but the ingredients (including whole milk) are ready to go. This looks absolutely fabulous. Cinnamon toast is my favorite. I am curious about the milk, since there is quite a bit of it in the recipe. What type do you use (skim/whole/%, etc.). I like to bake with whole milk, but wonder if it would almost make this recipe too rich? I make this with whole milk all the time, Teresa. I hope that helps! Hi Teresa- Mary said it best. I normally use whole milk. I love how tender the crumb of the cake is when made with whole milk. I have also made it with cashew milk and it was lovely. I’m thrilled that your family loves this every bit as much as mine does! I want a slice right now. I’m speechless right now. I mean, really. Is this cake for real? Doused in butter and cinnamon sugar and baked again???? I must have it. And I can’t blame your boys for devouring this- come on now. Do you think you could half the recipe and make in a 9×13 pan? Hi Celeste- I haven’t tested it in any pan other than the half sheet pan. It seems a forgiving cake, though, so I’d love to know the results if you decide to try it! I made this a couple of hours ago and it’s already more than two-thirds gone (I only have 4 kids so food must last a little longer in my house than yours). I just found my twelve year old sitting in the kitchen gazing at what’s left. He just turned to me and said “This cake’s heavenly!” Thank you! I tried this today as my contribution to a communal Super Bowl party. Not only was it easy, but everyone was raving! My family made me stash some so we would be sure to have some to ourselves. Thanks for the great recipe. I made your Korean style slow cooker pork BBQ tonight followed by this cake. Wowza! It was the perfect comforting Sunday meal! My husband loved it too! Thank you!! Will be making a test run of this today in preparation for my other mom’s birthday. I already told her that I was bringing this when we celebrate later this month. QUESTION: unsalted or salted butter? I am guessing unsalted….. I almost always use unsalted when baking. It won’t be disastrous to use salted, but I like to control the finished saltiness of my cakes and whatnot! This cake is rockin’ my world! AMAZING!!! I’ve been following your blog for about a year now. I work in the food industry and appreciate the family and professional perspective you bring to your content. I decided to make the cinnamon toast cake at work, and loved that the recipe was for a half sheet pan. I scaled it up to a full sheet, and didn’t need to adjust anything. Residents loved it. So did the staff. One of our part timers, who works at another facility, asked if she could take the recipe to her full time gig. Of course I made a copy for her with the full sheet quantities. I’ve never understood folks who think their recipes are the key to a hidden kingdom that no one else may enter. My need to feed extends to everyone. I’m going to be doing your recent meatloaf next. It looks like a riff on the vegetable meatloaf in Molton’s classic “Food for Fifty.” I’ll let you know how that one’s received. I made this today for a club meeting and talk about a BIG hit. One club member came over to tell me that the cake was phenomenal. A number of people commented on how good it was. Three people asked for the recipe. It cut beautifully and made for a nice presentation. I think all this adds up to be a winning recipe. Many thanks! a tea time goodie too. Thanks for a keeper recipe. You’re so welcome, Betty! I know the temptation on nibbling all the cake up! I make myself wait until I know I’ll have a house-full before I make it now, or I’ll gobble it all up myself. Thanks for taking the time to let me know you like it! 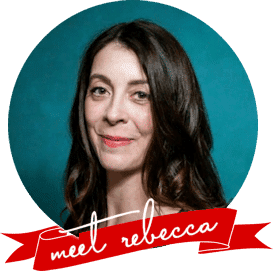 Rebecca, this recipe is fantastic! And I’m delighted to report that I was able to halve the quantity of batter and then divide that into two round pans to make it into a two-layer birthday cake! I did the vegan version, and I lined my pans with parchment to make sure the layers would come out in one piece. I topped it with a vanilla frosting, and it was like the most delicious French toast with whipped cream. Everyone loved it! Thank you! Oooh, Sam! That is such great news! I’m so glad it went over well and I love the layer cake idea. An update on making the vegan version. I have some good friends who try to eat mostly vegetarian/organically, so as a thank you gift last fall, I made this with coconut oil and cashew milk. They were thrilled with it! When they had a neighborhood party this summer, it was my contribution (this time with almond milk which was just as good). It didn’t last half an hour! Last month he helped us move son’s sofa to a new apartment and wouldn’t let me pay him. But when I offered to make this, he jumped at it. I offered to make it with dairy, but he has found that dairy now bothers him. I delivered it just before Hermine was supposed to hit and his wife answered the door saying “we’re now ready for the hurricane – water, wine and cinnamon toast cake – what else do we need!” Fortunately, we were spared the worst of Hermine. I made this for a camping trip this past fall.. There are 15 of us so it disappeared in no time. Everyone loved it and asked for it for Christmas brunch. I am looking forward to making it again in a few days. It is so easy to put together. What a brilliant bring along for camping! I made this for. Bake Sale, I used 3- 9 inch square foil pans and baked them about 20 minutes for the first bake and 8 minutes for the second. Sprinkles on some white sparkle sugar while still hot for eye appearance. Covered them with plastic wrap and tied red and white bakers string on them. They were gone in minutes! 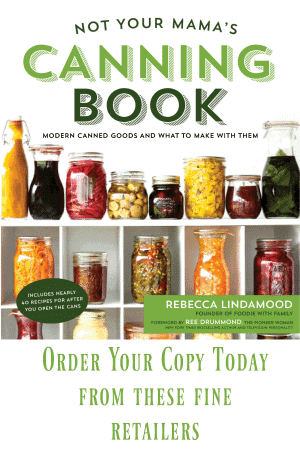 for all the lovely recipes !